Debt consolidation, also known as credit consolidation, is a way to merge multiple debts into a single lower-interest loan. It is often done when you have multiple high-interest unsecured debts, like a personal loan or credit card bills. Consolidating your debt lowers your monthly payments, in part, by increasing the length of time for repayment. It can help make your debt more organized and manageable. Significant debt can be overwhelming. When you’re drowning it, debt consolidation may seem like a life preserver. In many cases it can be helpful, but there are factors that warrant consideration first. Learn about what it does and doesn’t do, and what drawbacks are before making your decision. To consolidate your debt, you typically take a consolidation loan out from a bank or other lender that will merge your other debts. Paying on time. The lowered monthly payments of a consolidated loan may make it easier to make your payments on time which will help your credit score. Creating a credit inquiry. Too many inquiries can shave a few points off your credit score. It could also lead lenders to believe that you rely too heavily on borrowed funds. Losing account history. Payment and credit length account for 50 percent of your total credit score. Closing these accounts means losing valuable history that may negatively affect your score. Opening a new line of credit. If your credit reports are stacked with debt in addition to the accounts being consolidated, adding another to the mix could cost you. Too many lines of credit at once can result in a credit score drop. Total cost over time. A consolidated loan means lower monthly payments but more money spent over time. If you can meet your individual payments it might be worth saving the money. Consolidation loan terms. The interest rate for you consolidated loan should be lower than your other loans. If you don’t think you can make payments with consolidated terms it probably isn’t worth it. The right lender. Do plenty of research before choosing a place to consolidate. Some lenders might have enticing offers but worse terms overall. Remember, lenders are not impartial and ultimately want to make money. Length of loans. If you’re almost done paying off a loan it is better to finish paying it rather than role it into a longer length payment. Money habits. Consolidating your debts will not fix any money habits that might have caused problems to begin with. Affordable payments. If you can’t afford the consolidated payment you may want to consider debt settlement or bankruptcy instead. 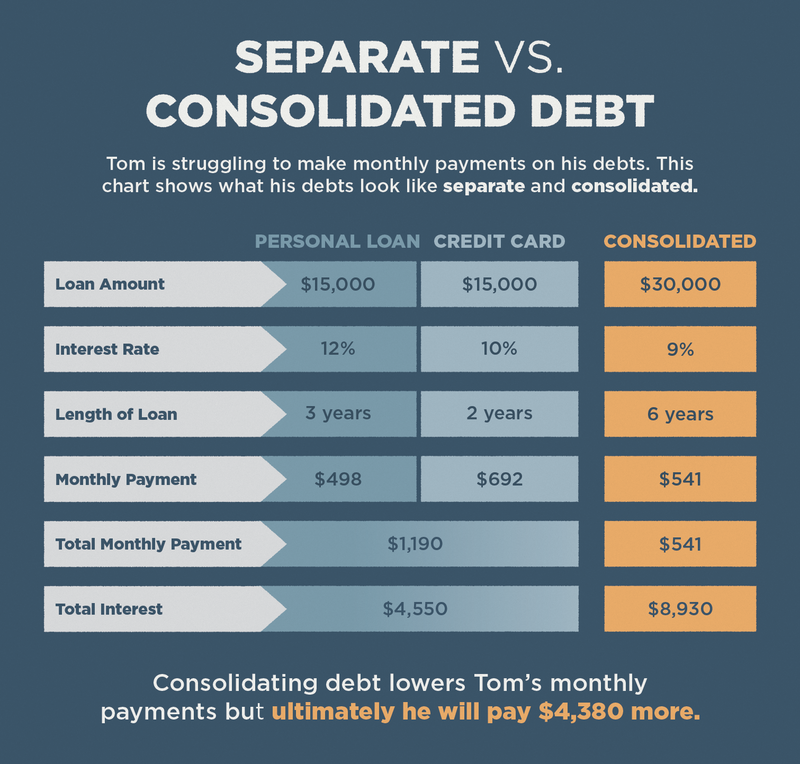 The biggest pro to consolidating debt for many people is the lower monthly payment. This reduces the financial burden and can make it easier to make payments on time. It can also make it easier to put money aside for an emergency rather than put it all towards payments. Consolidating multiple debts into one debt can make keeping track of debt easier to manage since there is only one account to follow. Paying more in interest. In addition to lower interest rates, consolidation loans often come with lengthened payment terms. Although you may be paying less each month, the years added to the life of your loan will likely force you to pay more overall. Losing your home. Unpaid credit card debt is subject to collections; an unpaid home equity loan is subject to foreclosure. Think carefully about your financial situation before putting your home on the line. Discharging options. If consolidation is the last resort before bankruptcy, think twice. It may not be possible to discharge a consolidation loan in the same way as consumer credit, leaving you with even less financial protection. Accumulating more debt. Some consumers make the mistake of paying off their cards with a home equity loan only to run those card balances back up at some point later. Don’t consolidate your revolving credit debts in this way unless you are committed to changing your spending habits. Debt consolidation can help lift the burden of high monthly payments, but comes with plenty of other risks. It’s not a decision that should be made lightly. Take the time to make sure it’s worth it in your specific circumstances. It’s also important to commit yourself to improving financial habits and repairing credit.